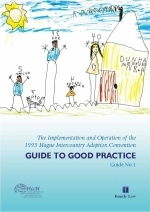 The Permanent Bureau is pleased to announce the official publication of the 1st Guide to Good Practice for the 1993 Hague Intercountry Adoption Convention: The Implementation and Operation of the 1993 Hague Intercountry Adoption Convention: A Guide to Good Practice. A copy of the new Guide will be sent to all National Organs, Central Authorities and accredited bodies in September in either English or French. The Spanish Guide will be available by the end of 2008. The new Guide identifies important matters related to planning, establishing and operating the legal and administrative framework to implement the Convention. It is directed at policy makers involved in short term and long term planning to implement the Convention in their country, as well as judges, lawyers, administrators, caseworkers, accredited bodies and other professionals needing guidance on some practical or legal aspects of implementing the Convention. Importantly, the Guide tries to emphasise the shared responsibility of receiving States and States of origin to develop and maintain ethical intercountry adoption practices. At the heart of the matter are the child's best interests, which must be the fundamental principle that supports the development of a national child care and protection system as well as an ethical, child-centred approach to intercountry adoption. A PDF version of the new Guide (1 MB) can be downloaded here.